Relax on the wrap-around porch. The cozy sweet private apt. has tall windows, lots of sunlight and historic wood floors. A quick walk to great restaurants, bars & coffee shops. Nature beckons at City Park, a 5 min. walk. An Olympic size free City Pool 3 blocks away is a great place to spend a hot summer afternoon. Please note: No TV. But there's one in every bar in town! Location, comfort, we’ll stocked to get a visitor started. Just what I needed for a busy weekend stay. Very quiet and good bed! The property was exactly as pictured. We were super close to everything and could not have asked for a better stay! The porch is absolutely amazing and perfect for just relaxing (while you can). We were there for Mardi Gras so relaxing was minimal, but this property and its proximity to all if the action was a huge plus! Thanks again! We were glad to have you. 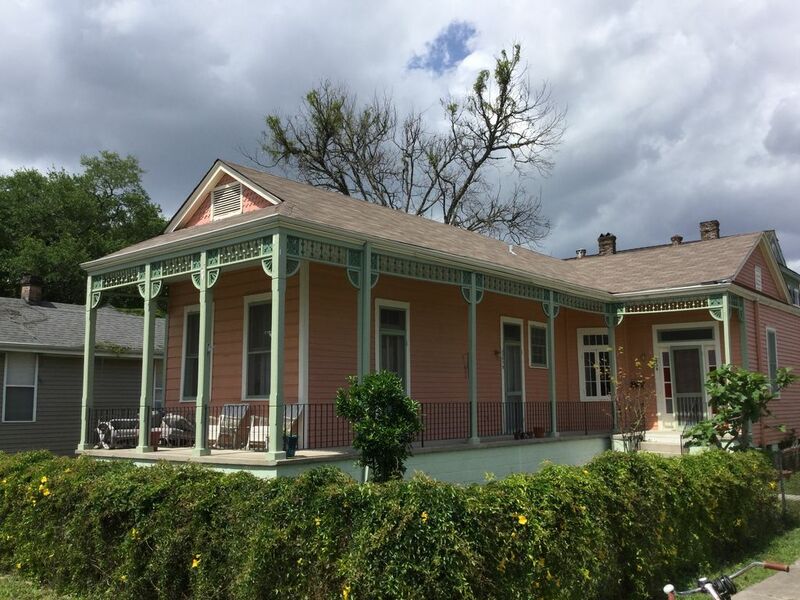 Great Porch, Good Neighborhood, Close to City Park, away from the French Quarter. This was our first trip to New Orleans. I am happy we decided to stay in Mid City and not near the French Quarter, although you can walk to the Street Car in about 10-15 minutes and be in the French Quarter in about 25-40 minutes depending on the time of day for $1.25 or $3 for a day's pass. The front porch was the plus to this property, and we spent a lot of time on the porch especially because it rained a lot during our stay. When we travel, we prefer a small personal unit like this over a Hotel. The property is attached to another unit, but we had plenty of privacy. It has a small kitchen with a table to dine at in case you would rather eat a few meals there, instead of eating out all the time. We picked up Shrimp at the French Market, cheap like $5 a pound and some corn $2/1.00 and cooked it there & enjoyed just relaxing on the porch to escape the Noisy French Quarter. There is a small grocery store about 10 minutes away. The Kitchen is adequately stocked with dishes, pans, coffee maker, etc. I know who goes to New Orleans to cook, well I found the food in New Orleans, not quite to my liking, (I live in Wisconsin and Brats and cheese are more my liking!) although my Husband loved the abundance of Oysters, Crayfish, Po Boys, so the kitchen kind of saved me. There is a place called Verti Marte on Royal Street that has amazing food, and I wished we would of found it early on in our trip. There is a double bed in the sleeping area, and although comfortable, it could of used some better pillows. There is a small love seat that has seen better days. The Bathroom is definitely on the smaller scale, but adequate. There is a cute double sided old fireplace that does not of course work but added a lot of character to the unit. It is situated in a neighborhood that does have a few Restaurants that you can walk to and we stumbled on a place called Luiz's I believe, that had cheap drinks and good Po Boys according to my Husband. The Neighborhood has some very nice homes in it, and we spent a few hours exploring it along with one of the Famous Cemeteries down the street. We were there during Boogaloo in the Bayou, down the street, which was fun. There is a lot of construction going on in that part of the city, and we are early risers so the construction noise didn't bother us. We are simple people and don't need a lot of frills when traveling, so this property suited us just fine. Although the unit is surface clean, it could use a deep clean.